Shortly after Dorena Bertussi’s name was published in one of the first major sexual harassment scandals in the House of Representatives, she came home to the sound of a ticking clock on her home answering machine. The police told her she might want to find someplace else to stay for a while. It was one of many episodes that help Bertussi understand — perhaps more than most — why 29 years later a national firestorm over sexual harassment in American institutions has been slower to ignite in Congress. Bertussi has since shared the details of her story countless times when women who worked in Congress or other government jobs approached her about following in her footsteps. It is no surprise to her, she said in a recent interview, that most of those women never came forward — and that even today, amid the cascade of public complaints against high-profile figures in other industries, members of Congress have been largely spared. Never mind that Bertussi told those women that she would have done it all over again. Never mind that, in the intervening years, Anita Hill forced a national discussion about workplace sexual harassment and Congress made a few attempts to make it easier for staff members to report their own claims. Bertussi’s case inspired Capitol Hill’s Women’s Political Caucus to write a model sexual harassment policy, which it circulated to all members. It is also still cited in the ethics manual distributed to House members. “It’s a tough decision to make,” she said, adding that coming forward with a sexual harassment complaint in the clubby and competitive world of Congress had reverberated in every part of her life and career for years afterward — and to some extent, it still does. Who would want to go through that, she said, without a guarantee that it would make a difference? In recent weeks, dozens of powerful and famous women have come forward against equally powerful and famous men in industries including Hollywood, publishing, art, comedy and business. Those accounts have emboldened others with fewer resources to post their own stories using the #MeToo hashtag or in other public forums. Allegations have shaken the leadership ranks at prominent institutions, including National Public Radio, ABC News and several state legislatures. And Congress has responded with the first stirrings of change in its approach to sexual harassment in decades. Bertussi lodged her complaint in 1988, but her experience has taken on new resonance as allegations continue to surface. As has been the case for many of the women who have recently come forward, she had to brave a torrent of publicity to make her case. By the time she received that ominous phone message, she had already fielded countless calls from political operatives, who hoped her account that her popular and charismatic boss had dry-humped her leg might give them an edge at the polls. She would later allow Larry King to mediate on live television as the same boss, former California Democratic Rep. Jim Bates, disputed everything she said had happened in his office, even though colleagues and constituents had been present for much of it. Bertussi would be warned that Bates planned to release damaging information about her past, causing her to wonder whether he had hired a private investigator to discredit her. With her allegations hanging in the media, along with those of another staff member who eventually came forward, Bates would go on to win re-election in November 1988, with the support of the National Organization for Women. The House Ethics Committee eventually found truth to Bertussi’s claims and issued the first-ever public reproval of a member for sexual harassment in 1989. Bates had to write a personal letter of apology to Bertussi. It was the most lenient reprimand at the committee’s disposal. To Bertussi, the gesture seemed like a slap on the wrist. Bates also took issue with Bertussi’s description of the contact he had with her. He said he accidentally bumped her leg and apologized. Congress has done little since then to revise its procedures. It exempted itself from discrimination and workplace laws until 1995, when it passed the Congressional Accountability Act in response to another sexual harassment scandal involving former Oregon Republican Sen. Bob Packwood. The revisions, which remain in place, created a convoluted process for filing and resolving disputes. Congressional employees who want to file a complaint have to wait nearly three months before they can officially do so. A Roll Call report in February found that few congressional employees make use of the process to report harassment. A CQ and Roll Call survey of congressional staff in July found that four in 10 women believed sexual harassment is a problem on Capitol Hill, while one in six said they had personally been victimized. And formal public complaints are rare. The most recent to result in a legal resolution was in 2015, when GOP Rep. Blake Farenthold of Texas settled a sexual harassment case with his former communications director Lauren Greene, after a series of inappropriate comments. Both chambers of Congress are now working to create a better system. The Senate this week approved a bipartisan resolution that would require periodic sexual harassment training for senators and their aides. House leaders from both parties have called for similar changes, and a half dozen bills have circulated that would revise the way Congress addresses complaints. The authors of one of those bills, Brenda Lawrence, put her chief of staff on administrative leave after Politico published a story alleging that he had harassed multiple female staff members. Accusers, meanwhile, have been reluctant to come forward. A handful of women have shared stories with The Washington Post, New York magazine and other publications of unwanted sexual comments, groping or assault by members of Congress and senior staffers while they were working or interning on the Hill. Few of them allowed their full names to be printed. Some of those accounts were initially shared under the #MeToo hashtag, among thousands of personal accounts that women have circulated in recent weeks. But when Rep. Jackie Speier launched her own hashtag, #MeTooCongress, to draw attention to harassment in Congress, hardly anyone shared a story about something that had happened to them on the Hill. A spokeswoman for the California Democrat said the office had received numerous calls from people who wanted to share such experiences anonymously. Even the handful of current and former congresswomen who have released their own accounts of harassment have declined to name names. Meanwhile, more than 1,500 current and former staff members signed a public letter demanding better training and a resolution to harassment complaints. Travis Moore, one of the authors of the letter and a former staff member, said he was motivated by the experience of a friend who has also declined to come forward. The lack of allegations that have stuck so far in Congress did not surprise Jennifer Drobac, a professor at Indiana University’s Robert H. McKinney School of Law. Bertussi has long since moved past the pressures of life on the Hill that made it so hard for her to come forward all those years ago. She has built a successful career as a government contractor, with clients including the Department of Defense and the Navy. She now works for a government agency that she asked not to be named in this story, though she got approval from supervisors to speak to a reporter. Bertussi gives off an air of relaxed confidence. She wears her grayish blond hair loose and long with blunt bangs, a style reminiscent of her native California. The effect was heightened on a recent afternoon by the layers of silver necklaces she wore and a tray of crystals in the living room of her Alexandria, Virginia, apartment. The anonymous accounts coming from Congress have reminded her how little the culture has changed since she tried to offer herself as an example, she said. She was one of 20 of Bates’ staffers who anonymously contributed to a story in Roll Call that first brought the harassment allegations against him to light. But only one of her other colleagues, Karen Dryden, joined Bertussi in her Ethics Committee complaint. Bates, who was 47 at the time, apologized for kidding and flirting with women on his staff but maintained he was not guilty of sexual harassment. At the time, Bertussi was 34 — a decade older than many of her co-workers. She said that was one reason she had the confidence to report the behavior others had tolerated. But it still involved painful sacrifices. 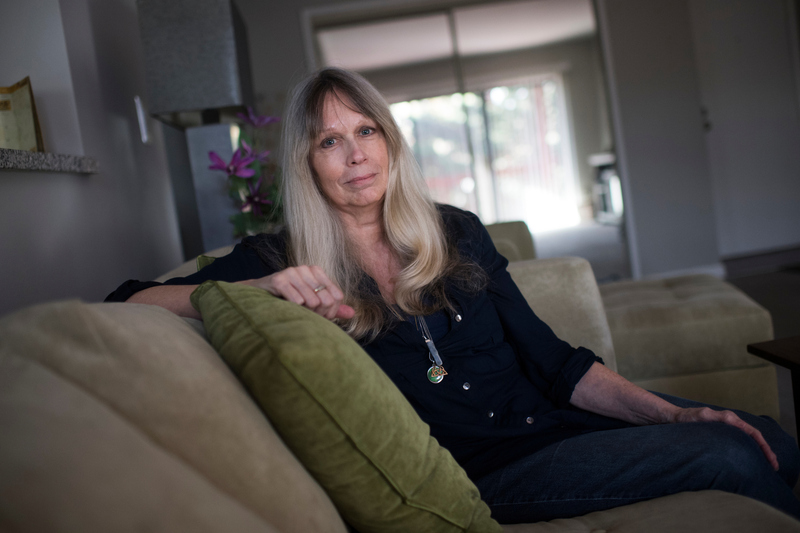 In the throes of what she described as an early midlife crisis, she had just sold her house in San Diego to move to Washington and start a dream career in politics. She was thrilled by her new life as a legislative aide: the sprints through the marble hallways, the reams of information at her disposal as she wrote memos that could eventually be incorporated into law, the chance encounters with people she had previously seen only on television. After Bertussi filed her complaint, staff members from other offices would call to privately relay their bosses’ support. Few made the same assertions in public. It was lonely, she said, a feeling that was enforced a few years later when she watched female lawmakers insist that the Senate Judiciary Committee reviewing Clarence Thomas’ Supreme Court nomination fully consider testimony from Hill. Why, she wondered, had they not done the same for her? Bertussi hopes that this time around, when someone eventually does come forward — as she believes they will — it will elicit a more thunderous show of support. And in spite of everything she has endured, she said, she is proud to have paved the way.